Ever wondered what the Best Pre and Post Workout Snacks are? Here are 10 options, with information as to why these are good choices! There is SO much information out there about what workout to do. You can find THOUSANDS of pre-made workout plans out there to suit your needs. But, you know what can be hard to find information on? What makes a good pre workout snack and what makes a good after workout snack? 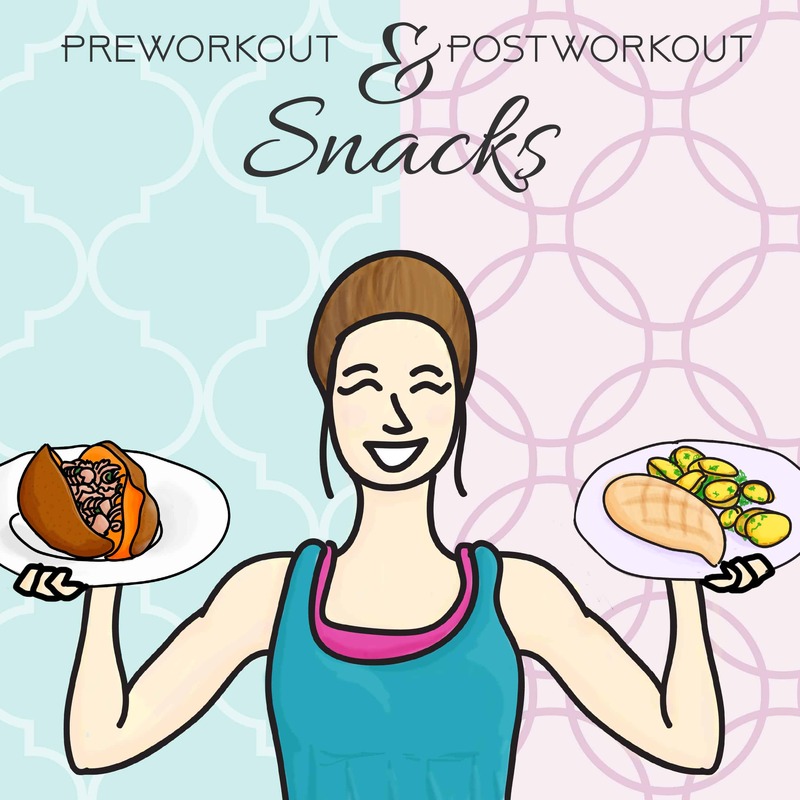 I get questions about what the best pre and post workout snacks are ALL THE TIME, so I figured it would be a good thing to write a blog post one! Now, I am NOT a doctor or Dietician, so nothing I say here is any kind of medical advice. BUT, I am a certified personal trainer, nutrition coach, and have worked with a really awesome trainer in the past who taught me a few things. PLUS, I practice this pre and post workout eating strategies in my own life and have found them to work VERY WELL. So, let’s shed some light on what are the best pre and post workout snacks! What is a good pre workout snack? Fruit is a pretty good choice for a carbohydrate as a pre workout snack as well, especially if you workout relatively soon after eating, as fruit does digest a little bit quicker then the items listed above. 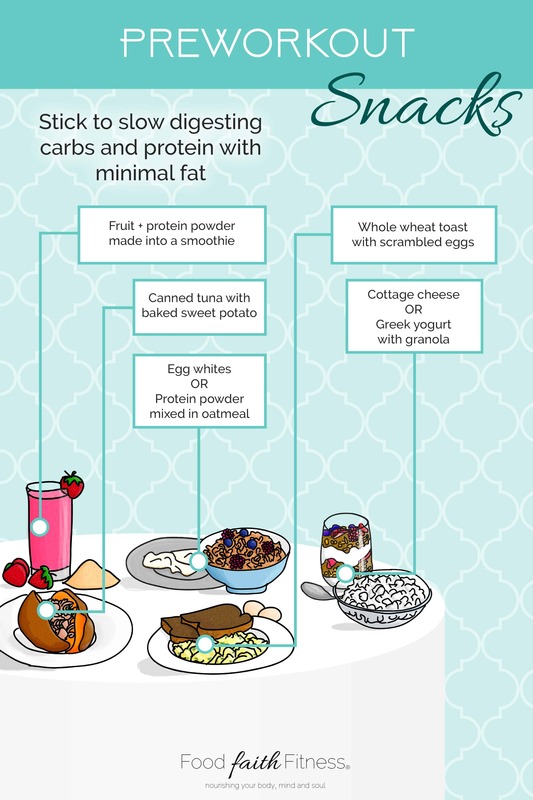 Eating a complex (read: slow digesting) carb will help to continue to fuel you throughout your workout as it will be digesting and giving you energy as you exercise. However, this is a balance and you don’t want the carb to digest TOO slow or you may end up feeling ill. This is why you keep fat to minimum, as fat slows down the digestion further. Add some lean protein to build your muscles and you’re set! Keep it lean (chicken breast, egg whites, lean cottage cheese, protein powder etc.) to avoid adding that dietary fat. How soon to workout after eating? If you eat a small meal, you can typically wait 1-2 hours. If you eat a larger meal, I would recommend 2-4 hours. Do what makes YOU feel good. IF you are doing strictly cardio after a workout, I personally feel it’s best to wait on the longer end of time. However, again, do what makes you feel comfortable. Doing cardio too quickly after eating makes ME feel SICK. Some people do also do cardio better on a empty stomach or eating quick digesting carbs (discussed below) if doing cardio. This is a situation where you need to see how your body feels! Fruit with protein powder made into a smoothie. Canned tuna with a baked sweet potato. Whole wheat toast with scrambled eggs or egg whites. Egg whites would be the BEST choice, as they are fat-free, but I know some people don’t love just the whites! Low fat cottage cheese or Greek yogurt with (oatmeal based) granola. If you have a grain-free granola that is mostly nuts and seeds, this wouldn’t be an optimal time to eat it, as we have that limit on a lot dietary fat. Now, what are the best post workout Snacks? In this window, you want to focus on QUICK digesting carbohydrates, lean protein and minimal fat. After you have demolished your glycogen stores (glycogen is what your muscle stores to use as energy) at the gym, you want to replenish it QUICKLY! Therefore you want to focus on simple, quick-digesting carbohydrates here. Fruit is still okay here, as well as things like white potatoes, bread, cereal or chocolate milk. You may be like WHAT? WHITE CARBS? AND the answer is YES. These things are really GREAT to eat in this window of time. It’s not unlikely to see me chowing down on some fruit loops after a heavy leg day! Again, we’re keeping fat to a minimum because we want those energy restoring carbs to fuel our muscles ASAP. Again, the sequel, add some lean protein (at least 20-30g) to help build your muscles as well. As far as timing goes, the ideal time to eat after a workout is within 30 minutes to get those muscles refueled as quickly as possible; but don’t stress if that isn’t do-able! I try to get a post workout snack in within the hour. Cereal with milk and a side of low fat Greek yogurt or cottage cheese. Maybe add some fruit too! Chocolate milk and Greek yogurt. The sugar in the chocolate milk is a great quick digesting carb! Chicken breast with white baked potato. Add some low fat sour cream to make it yummy! I hope this sheds some light on the best pre and post workout snacks! Nuts are high in fat which slows down protein getting to your muscles 🙂 But do what works for you! This is really useful! I think it is important for people to remember that eating after a workout is just as important as a pre workout snack. 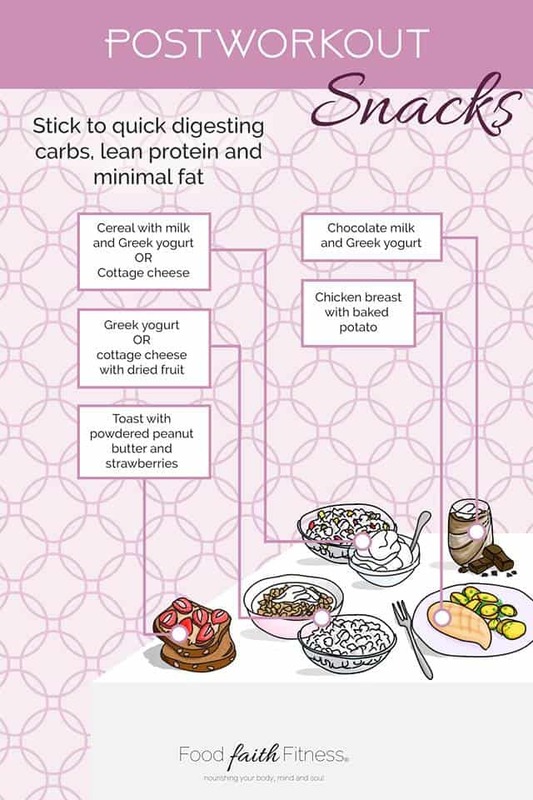 I think that greek yoghurt is a go to option when it comes to eating after exercise but I’d rather have this with something like a banana as this is a fast acting carb which will be beneficial in order to restore your body after strenuous exercise. YES! eating after I would argue might even be more important! Totally agree with the banana!